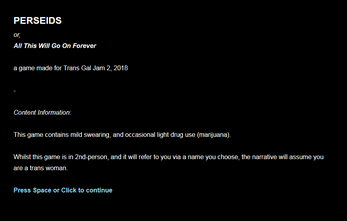 Made for Trans Gal Jam 2. Four trans girlfriends go on a road trip to a dark sky park, to see the perseid meteor shower. A 6.5k-long twine* story, with small branches but a single ending. There's very little conflict, drama, no-one dies. Just a good time. Features a 5-song soundtrack also available here, with the in-game versions lovingly destroyed filtered as though they sound like they're playing through a blown speaker whilst you're driving through the countryside. Shown at AdventureX 2018 and Melbourne Queer Games Festival. 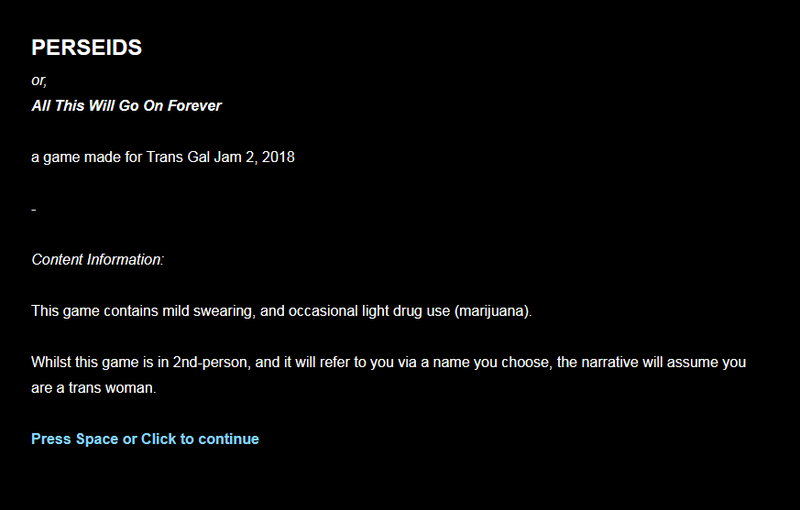 This game contains mild swearing, and occasional light drug use (marijuana). Whilst this game is in 2nd-person, and it will refer to you via a name you choose, the narrative will assume you are a trans woman. Where you see a ~, you can press Spacebar to advance. Choices will be labelled z, x, and c. Spacebar will pick the first choice, if you press that by accident. 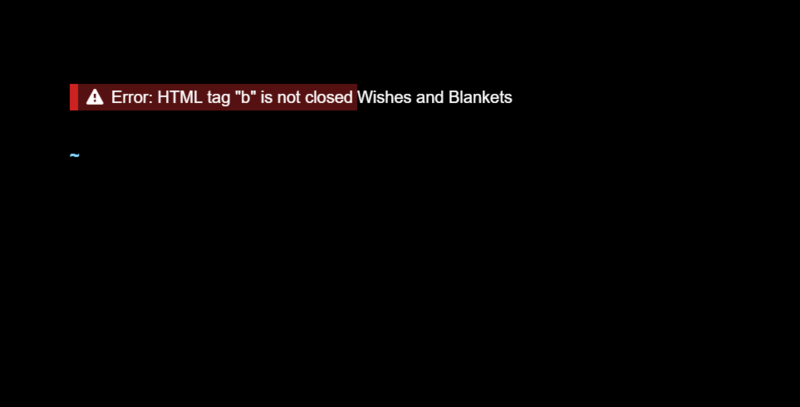 Press Enter after filling in a text box to advance. I really enjoyed the story. Initially I named myself Rose, which was kinda confusing, haha. Really nice music as well!! huh, weird. At least you enjoyed it even without music :) Can I ask what browser you were using? I downloaded it and played via the itch.io client. This is so sweet, and really captures the feeling of a summer road trip with friends - well, maybe with more cute flirting in it. hehe thank you 💖 I guess the amount of flirting depends on which friends you go with! To clarify - your game had more flirting in it! this is really cute and sweet!! i love it!!! woops. thanks for that - have fixed it now!